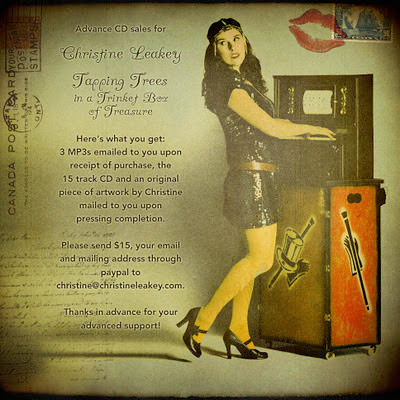 New pleasant surprise entered the inbox this week; Christine Leakey - why, she just leaked a few songs into my inbox, har har ugh - is a darling Canadian lady in her upper 30s who not only enjoys making cashew cheese and blogging, but is coming out with a record this January. The loungy, mildly jazzy teaser for her debut solo album (Tapping Trees in a Trinket Box of Treasure) is available for free on her Bandcamp page (as is everybody's music, it seems). These songs are soft and sweet, her aesthetic more retro than the music itself, and if you tend to crave artists like Eleni Mandell, the Real Tuesday Weld, or - by a slight stretch - Azure Ray, Leakey may be the lady for you.